As a kid I didn’t have any Lego. But I had Bambino. Bambino was a rather cheap alternative for Lego, but of course I didn’t know that back then. I cannot remember that any of my friends owned Lego, and I think I didn’t even know it existed. I can remember when I first played with Lego, in the room of a ten year elder uncle, who had a small box with dirty red, bleu and white Lego-stones that you could built a house with, complete with windows and doors. I liked it, but when at home I just as much enjoyed playing with Bambino. Of which my brother and I had a big collection, by the way. 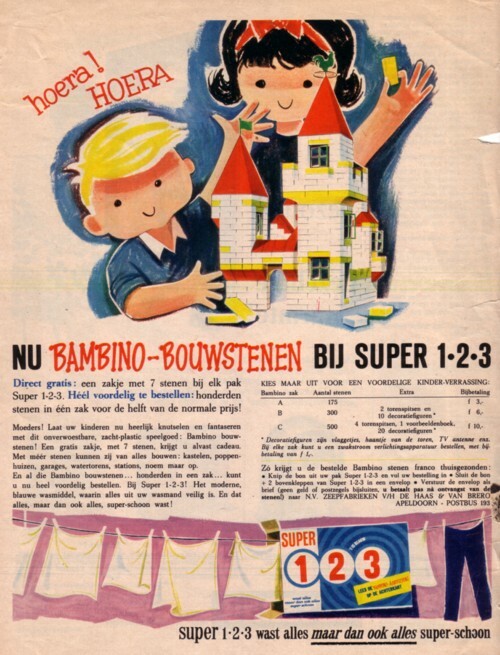 Only a few years ago I found out that Bambino building stones were not for sale in shops: you could order them with coupons (and extra money) that came with Super, a washing powder. And to my surprise I also found out that there were little people knowing about these Bambino building stones. I thought that everybody my age had played with Bambino! Even on the Internet I could not find much about Bambino. Well, some ads on Marktplaats.nl, where these stones are for sale. But I am not interested in buying all the toys of my youth back: I just want to know who made them, how much different stones there were, what people have built with them, etcetera. Lego sounds very much like Ego. I noticed this similarity when I was trying to find metaphors for the working of the mind/personality/ego: it not only sounds similar, it also works similar. Our mind is made of small elements, a.k.a. “I’s”, that can be put together in more than one way. The problem is that after a certain age the de- and re-construction of our Ego-stones becomes harder and harder. In many esoteric traditions it is said that it is almost impossible to do any work on oneself when that person begins after the age of forty. The aim of esoteric traditions is to break the mind/personality/ego down to it’s elements and to learn to re-built it only temporarily, to fit a certain situation, and to break the construction down again after it has served it’s purpose. I am amazed that this Lego/Ego metaphor has not been used yet, as far as I know. It seems to be that it can be a very helpful one. We already use terms as ”building a personality” , ”an inner world” and so on. To think of the mind/personality/ego as a toy-building sure helps me to get a better perspective on my situation. In many traditions the mind/ego/personality is described in abstract terms, that make too much a mystery of it. This Lego-instrument is a marvellous metaphor for the Ego-instrument. It is a brilliant construction, but it sounds like a poor imitation of the real thing. I saw a t-shirt with “EGO” on it in the style of the LEGO logo which would make a nice illustration to your story. I tried to find a picture of it with google, but to no avail. I did however find an artist named “Nathan Sawaya” that builds entire bodies out of legobricks: yellow torso. Bambino building bricks were manufactured by DS plastics in ‘S Heerenbergh. After 20 years production was moved to Barcelona in Spain where it was made for another 20 years. Production was only halted about 10 years ago! It included three sizes: Mino, Medio and Makro and during its astonishing 40 year history it operated with different ranges of bricks, including the less known round tower and train sets. The Bambino bricks are normally mixed up with almost similar Monti bricks, made by Bercolux, Tiel.